Looking for more protein in your diet? Want to speed up your post-exercise recovery? If so, you’ll want to enter to win Designer Whey Protein Bars. No matter what type of exercise you like, Designer Whey products, including protein powder, shakes, bars can help ensure your muscles recover so you get the most out of your body at each workout. What’s more, the Designer Whey website has a lot of great nutrition information, delicious recipes, workout and training tips to help you reach your nutrition and fitness goals. The brand is even seeking strong, fit women to serve as ambassadors for the brand–so consider signing up! Ten lucky Appetite For Health fans will win a variety of delicious and nutritious Designer Whey Bars. Whey protein is a high-quality proteins present in cow’s milk and is considered one of the best for muscle protein synthesis. Whey protein contains all nine essential amino acids and is particularly rich in leuicine, the amino acid most research reveals is critical for enhancing muscle recovery. Whey protein is fast-acting so it is a great choice to have before and after exercise to help muscles recover and build new tissue. fast-absorbing protein and the preferred protein to flood the body with the complete range of amino acids so muscles can recover faster. Designer Whey Protein Bars have 10 grams of protein, 160-170 calories and they’re fortified with 14 different vitamins and minerals. I enjoy the bars when I’m traveling, as part of my post-exercise recovery and I like to have them when I’m out on a hike. What’s more, they come in great flavors like Triple Chocolate Crunch and Peanut Butter Crunch. The crunchy texture and creamy ingredients combine to create one of the most craveable protein bar you’ll ever try. Entries will be accepted until midnight EST, Friday, July 19, 2014. 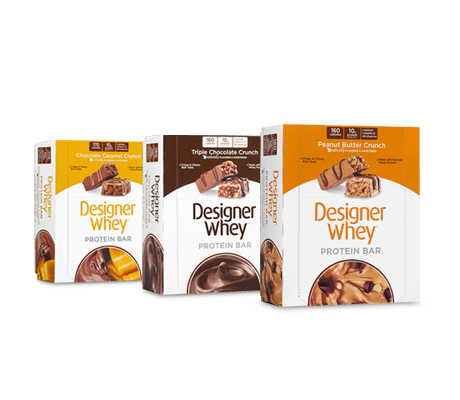 Designer Whey bars sound like the perfect blend of protein, vitamins and minerals for an on-the-go snack. I go from appointment to appointment, and these would provide a lift-me-up snack break for me. I’d stash one in my handbag before leaving home. I’d also take them along for long car rides. They sound like a win-win bar! I just recently read about whey and was interested in giving it a try. This would be a good way to give it a try. I would love to have these for my post- workout car breakfast. I go to the gym for 5:15 classes and then head straight from there to teach middle school. I do not always have the clarity when I wake up at 4:15 am to pack a healthy breakfast, or sometimes any breakfast at all. I would love to have these protein packed bars to sustain me until lunch. I need to add more protein to my diet and bars are a great way to do it. I love their protein powder. It would be nice to try the bars especially when you need a snack that would hit the spot. These would be great post-workout! The flavors sound so yummy! Thanks! This would be a great snack after my length walk in the foothills and also to have in the car. I would like to win its because I do go to the gym everyday and need post workout boost. Plus I haven’t find yet the right whey protein for me and it may be this one!! I’m trying to consume more protein in my daily diet! This product would be great to try! These would fit nicely into my protein-enhanced, eat healthier program that I’ve embarked upon. The calories are not excessive, the protein is perfect and they offer an added benefit of 14 vitamins/minerals. They also hit the mark with the flavors — who doesn’t like chocolate and/or peanut butter? I liked their page and already enjoy reading your informative e-newsletters! Thank you for this tasty giveaway!! Best of luck to everyone!!! This is a good gluten free option for me and will help me get more protein in my diet. Not a big eater so this is a great way to get more nutrition on the go. I signed up for e newsletter, I like AFH and Designer Whey on Facebook. I love Designer Whey protein shakes but have never tried their protein bars. I am very curious to try them. They sound incredibly nutritious and make a great substitute for a meal replacement in a rush or a better choice to have on hand when going to the movies or post workout snack. I want to try this. I would love to win these since they’d be a perfect after work snack. I would love to win because I am always looking for better protein bars and I think these looks amazing. love to give them a try. 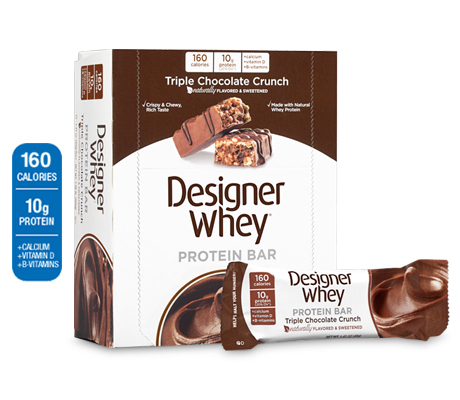 Designer Whey bars sound so good. Would love to win these, would snack on these after a good work out at the gym. I would love to try these. I need something that will help me stay in control of my snacking problem. I have seriously increased my activity level, doing a large amount of yard work that will take a long time to complete. I sure could use some extra protein!